A fuel resistant bottle designed to temporarily attach over the fuel tank vent to prevent spills. Designed for gasoline or diesel fuel and will fit all vents up to 1.5″ in diameter. Attaches to hull with two suction cups. 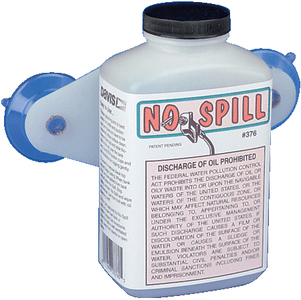 The Davis No Spill Fuel Recovery System 32 ounce is a fuel resistant bottle designed to temporarily attach over the fuel tank vent to prevent spills. Designed for gasoline or diesel fuel and will fit all vents up to 1.5″ in diameter. Attaches to hull with two suction cups. Click here for a downloadable PDF informational booklet.